In 2014 I began taking photos of upholstered furniture on streets across Durham Region. No plans for any special project at the time, I’m simply drawn to things we throw out. What initially interested me about these couches and armchairs, was how they were positioned on the curb. I noticed that most of them faced out to the street and very few of them had garbage or other debris on or around them. Even the cushions in most cases were properly placed. It’s almost a come-hither look, offered as a kind of gift to passersby and made to look as inviting as possible so they’ll find, not just a home, but a good home. I photographed each piece exactly as found because that seemed to me to be part of its history, and the connection to whoever left it there. In the face of this imagined love, I wondered why they were being chucked out. Also, when did we become such a disposable society that we pitch perfectly good furniture? 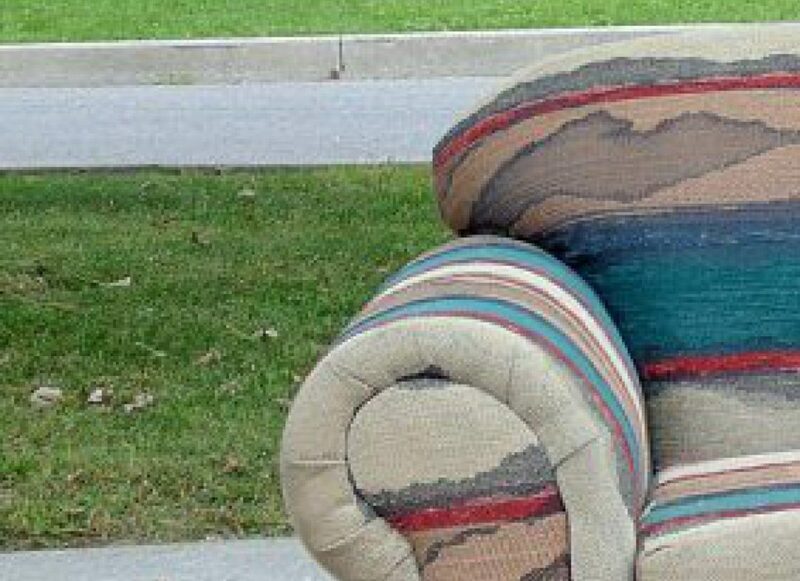 And this: why it is that the furniture most often seen at the side of the road is upholstered? What happens to all the dressers and desks and tables? The office chairs, the little wooden straight-backed things or the chrome and vinyl. Sure, you see them now and again, the occasional mattress or headboard, but far and away the most common item presented to the street is a piece of upholstered furniture. I think it’s because fabric holds things. Bugs… possibly. Dirt, cookie crumbs, loose change, definitely. But also intangibles… I think it somehow holds feelings. And memories. And so the photographs became a project. I asked people for their memories of couches and armchairs and was gobsmacked at the things they told me and the way conversations began from there. Then I attached one true memory to each of the photographs of orphaned furniture, a small nod in its direction, a tiny reminder that it’s part of someone’s life, not just a piece of junk on the road. Which becomes a reminder that everything and everyone has a history/herstory, a past. So I invite you to draw upon your own ‘couch’ memory. Share it with someone you love, or leave it here for others to enjoy. The sharing gives purpose to our discards and maybe also to the forgotten bits of our discarded past… one way for a disposable-society to preserve stories. Who: Carin Makuz is a writer currently obsessed with projects incorporating image and text, focusing on the discarded and abandoned. Her favourite photographic tools are a point and shoot camera and good walking shoes. She is the creator and curator of The Litter I See Project, a web site which supports literacy while addressing the problem of litter in our communities by engaging writers across the country to respond to pictures of litter with poetry, prose, stream of consciousness and other literary forms. She flanneurs and sometimes thinks out loud at Matilda Magtree.